The Jamaican Iguana belongs to the subfamily Iguaninae, within the family of Iguanid lizards comprising 31 species. Many of these lizards attain very large body size and all feed predominantly on plants. The genus Cyclura has eight species and is restricted to the northern part of the Caribbean. The Jamaican Iguana is endemic to Jamaica and reaches a body length of up to 150cm. or more, making it the islands largest native land animal. It was believed extinct since a remnant population on Goat Island, off Jamaica's south coast, disappeared in the 1940's. However, a carcass of one was discovered in the Jamaica's Hellshire Hills in 1970. Then in June 1990 a hunter and his dog cornered a male specimen which was brought to Hope Zoo. 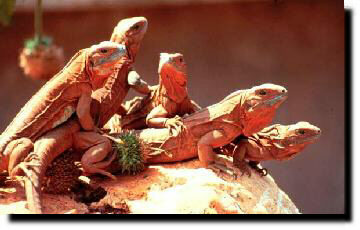 As a result the Jamaican Iguana Research and Conservation Group was founded. Supported by large numbers of volunteers, some 7500 man hours were spent methodically surveying the forest. Animals heard and seen provided estimates of at least 15 iguanas surviving in the area and the very first photographs of Jamaican iguanas were taken in the wild. The Hellshire Hill's, which represent an outstanding example of unspoilt dry limestone forest, are located west of Kingston, froming a peninisula which measures abou 10 x 15km. The area where most sightings have been made is some 4 kilometers long, much of which forms a steep sided natural crater. Two nesting sites were identified. There is very little or no soil covering the deeply fissured limestone substrate, the thick vegatation seemingly growing out of little more than bare rock. Opportunities for a burrowing lizard of the size of this iguana to dig and lay its egges are, therefore, few and far between. As field observations record a predominantly ageing population, it is almost certain that most iguanas succumb during infancy, probably to the ubiquitous mongoose. A program of collecting up eggs and hatchlings was quickly implemented and after two years up to 80 young iguana are growing up in the safety of Hope Zoo, Jamaica. These animals will be used as stock for captive breeding and for release back into the wild, having attained a size beyond the scope of mongoose predation. Apart from the mongoose, other threats to the iguana are posed from feral pigs and dogs, and by disturbance from charcoal burning. The greatest threat however, would undoubtedly be the developement of the area for human settlements. The Natural Resources Conservation Authority is endeavouring to protect the area in perpetuity.